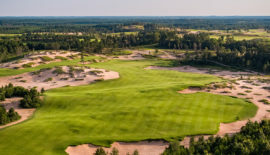 With the addition of the Tom Doak-designed wonder called The Loop, Forest Dunes Golf Club finds a limitless future ahead. ROSCOMMON, Michigan — It is an absolutely postcard-perfect spring day in early June, and the bright sunshine beating down on us is eclipsed only by Lew Thompson’s exceptionally sunny disposition. The Arkansas native and trucking magnate-turned golf resort owner/developer has plenty of reasons for his semi-truck-sized smile these days. 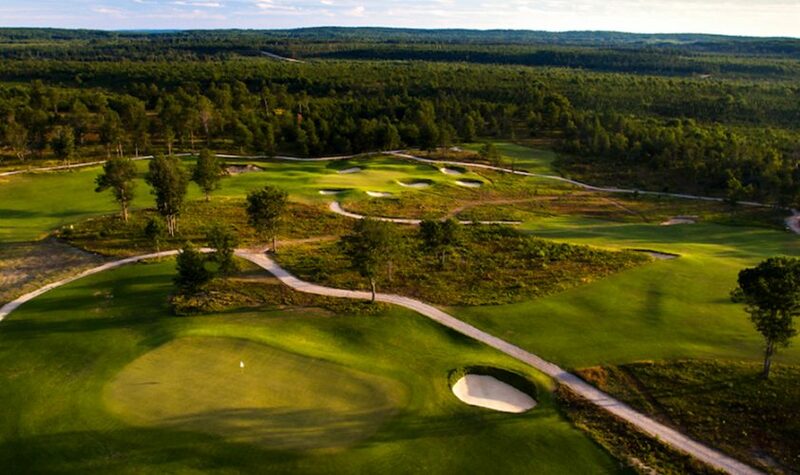 Not the least of which is The Loop, the 6,900-plus-yards of entrancing emerald-green fairways that officially opened at Thompson’s already-fantastic Forest Dunes Golf Resort this summer. Thompson, a towering man with a crazy-like-a-fox, larger-than-life persona, bought the resort back in 2011, bringing it back from the brink of bankruptcy and obsolescence. 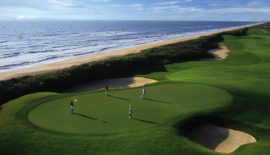 And he knows The Loop is ready to take the resort to the next level — into the forefront of the international golf scene. “Today, that’s probably 50 percent better than it was, but it’s still not where it should be. Today it’s a whole lot better than it was five years ago, but it’s still not what I would like it to be. The Loop, you see, is actually two courses in one. That’s right, Doak gave Thompson the deal of the century, designing a dynamite doubleheader — the Black Course and the Red Course — on the exact same footprint, two halves of the same holes. It was an idea Doak carried around in the back nine of his mind for more than 30 years, waiting for the right time, the right land, the right owner. He found all that and more, hidden away in the sandy pines at Forest Dunes. Of course, not only could it be done, Doak no doubt did it. But the most surprising thing about The Loop is that what makes it great isn’t a gimmick at all. It’s truly two distinctly terrific tracks, laid atop one another in a brilliant fashion that will no doubt inspire many courses to follow. The Loop might be the first truly “reversible” 18-hole golf course in the world, but it most certainly won’t be the last, at least not now. We started with the Red Course, all 6,806 yards of it, played counter-clockwise as the crow flies, the Yin to the Black Course’s clockwise Yang. Determined to spot obvious signs of its twin along the way, I stepped to the first tee, a rolling, 375-yard par-4 with an almost can’t-miss fairway. Like many of the holes here, you’ll have to work hard to find too much trouble off the tee (there’s 95 acres of fairway here, folks — and not a water hazard in sight). The Forest Dunes staff will tell you they prefer the comparatively gentler start and smooth finish of the Red, whereas the Black packs a bit more punch out of the gate and down the stretch. 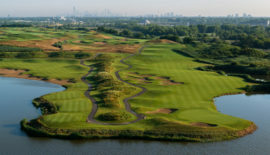 Right away, it’s obvious The Loop is unlike any other course in the Midwest, but not because it’s a “twofer.” It’s unique in that it might just be the most realistic Scottish links-style course on this side of the pond. Sound lofty? A few holes in on The Loop’s rock-hard fescue fairways, full of dips and bends and natural contours, a few shots you’ve flown to the hole only to find your ball 40 yards past, a few strokes you’ve putted from 20 yards off the green, and you’ll believe it: This is true links golf, and it’s an absolute riot to play. It is also very much the quintessential Doak design — minimalist, naturalist bunkering and fairways, followed by intricate, nuanced and sometimes stupefying greens complexes. The highlights of the Red, which like the Black plays a par 70, are the opening par-4, the par-3, 187-yard 4th (the first of five excellent par-3s), before you come to the short-but-sweet 6th, all 125 yards of it, playing up and over a natural bowl of native grasses. The sixth is part of what is considered the signature section of the course, also serving as the green for the Black’s fantastic 381-yard, par-4 12th hole — probably The Loop’s best duo. But it’s that ingenious routing that makes The Loop work so well. You’re not playing the same holes backward: you’re playing two completely different holes from day to day. On the Red’s back nine you’ll find the longest par-3, the 222-yard 11th, complete with a natural backstop, and the fun, driveable par-4 12th, at just 312 yards from the tips. 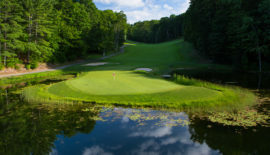 The Red’s finishing stretch leaves you hungry for more, with the 468-yard, straight-shot par-4 16th, which begs you to bring the big lumber, followed by the 184-yard, par-3 17th, and the awesome 18th, a monstrous, 474-yard par-4 that dips into a valley and back out and uphill to a massive green. After a great dinner in Forest Dunes’ dining room and a restful night in one of resort’s 14 comfortably appointed guest rooms, an early tee time on the 6,709 yards of the Black course awaited. The opener began where our previous round ended, this time playing 469 yards to the other end, across the valley to the uphill fairway and green beyond. It’s a rough way to start the day, and the precision needed at the 179-yard, par-3 second doesn’t make things easer! The front nine’s highlights include the awesome 348-yard, par-4 fourth, with a beautifully bunkered green complex found between two mounds, and the excellent 146-yard eighth. The back nine features the phenomenal par-4 12th, which plays down through a valley to a well-guarded green around the bend. The Black’s finishing stretch is as tough as advertised, with the long par-4 16th playing to a Biarritz green, a tempting-but-tricky reachable par-5 at 17, and an uphill battle awaiting you at 18, all 362 yards of it. After the round, you’ll debate which of the two courses you like best. 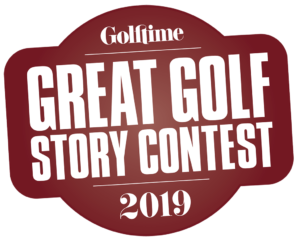 And while opinions may vary (I would prefer to pick my favorite holes on each course), one thing everyone will agree on: It’s a remarkable achievement, to build two distinct courses on a single landscape. It’s also a course — more than most — that needs to be experienced to be truly appreciated.